Cheese is a dairy product made from milk; depending on whether it is made using cow, goat or sheep's milk, the texture and taste of cheese will vary between the soft, mild, creamy types and the hard, pungent types. Cheese can either be enjoyed on its own, in a range of dishes or as a topping for pizza and pasta. Savoury muffins flavoured with smoked bacon and emmental cheese - perfect for brunch! A real favourite - oven baked goat's cheese crostini served with an endive, parsley and walnut salad finished with a sweet mustard dressing. 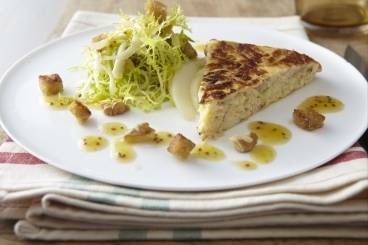 A light frittata made combining goat's cheese and leek, served with a walnut and pear salad. Japanese maki rolls with a salmon, goat's cheese and sun blushed tomato filling served with baby spinach, soy sauce and pickled ginger. 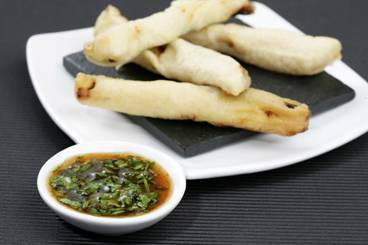 Melted cheese wrapped in crisp brick pastry and served with a fresh, home made pesto. 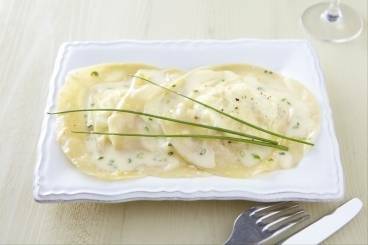 A fresh pasta tortellini filled with French goat's cheese and walnuts, served with a simple butter and chive sauce. 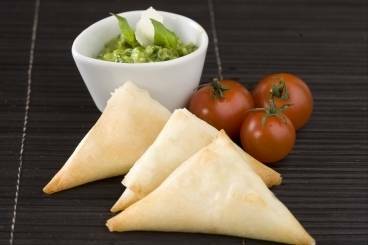 Crisp brick pastry samosas with a goat's cheese and sundried tomato filling served with home made pesto. A hot crispy treat, ideal for use as a canape, or a light meal with a leafy salad. A timeless classic for all ages. Either serve as a snack, for canapes, with dips or on the side of lunch.